This is a photo of the Hayden family. 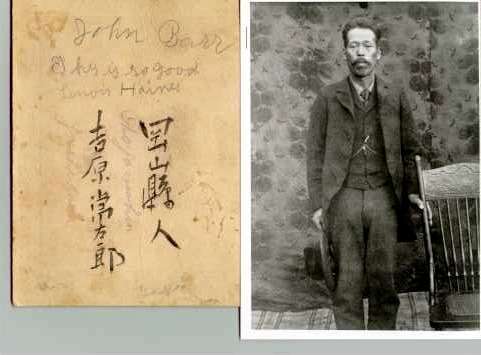 Because of them, we have the photos and stories of the two Japanese men below. This family became friends with these men who were working on the railroad. Maeda lived on their farm. He had his own garden for growing herbs, flowers and vegetables. This photo was taken in July of 1899 - just before the railroad was announced and the small valley exploded with population growth and two years before the final bombing of Ping Yang School. The Haydens were farmers and did not have much money. They highly valued education and had a good home library. Their interest in learning may have been one reason why they made friends with the Japanese immigrants in the Mohawk Valley. 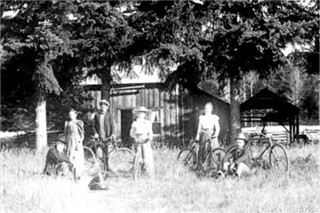 The woman standing on the right with the bicycle is Ella Hayden, a student at the University of Oregon. Ella Hayden later taught school in Lane County for over 30 years. She was a friend of Eugene artist Maude Kerns who became famed for her work with Asian art at the UofO. Maude Kerns taught at the Ping Yang school at the time it was bombed. Ella Hayden lived less than a mile away. The repeated attempts to destroy the school made both these young women more determined to be teachers. Each later had outstanding careers in education. The young man on the left wearing the hat is young Charly (actual spelling) Hayden. He was very interested in education, although he had to work on the farm and in the lumber mills his entire life. He also played the violin. One value he may have shared with his Japanese friends was a respect for his elders He took care of them for many years. Today a road near Marcola is named for him, Charly Lane and his descendents still live there. These pictures with the men's names and addresses written on them were given to Charly Hayden and his family. The man pictured here is Tsunezro Yoshihara from Okayama Prefecture. Also, written in English are the names of John Barr and Lenora Haines. There is also the phrase "Thy is so good". He probably learned English from missionaries who used a King James Bible with the common "thy" and "thee" and "thou" words. He may be writing that John Barr and Lenora Haines and the Haydens were good people and gave this photo to them when he moved. The young man is named Maeda. He lived with the Hayden family and had his own garden. It is not known how long he lived at their house. However, Jim Hayden, grandson of Charly Hayden says that they kept in touch by letters for many years. The man's name is Ichizaro Maeda. His address is: Tanaka Izumi Yoshiwa Saeki Hiroshima Prefecture. Perhaps someday we can locate his house. We are indebted to Jim Hayden, grandson of Charly Hayden (shown standing with the hat) for providing these photos of his family and their Japanese friends. 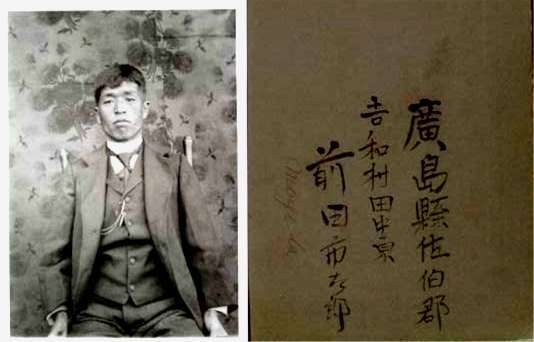 A future project would be to try to locate the descendents of these Japanese men.